When I started working in open, it was because I realized that I could make a free version of my early American literature textbook and save students about $90USD each. That kind of money is a drop in the bucket for New Hampshire undergraduates, who have the highest student loan debt in the nation and the lowest state funding for higher education. But it’s precisely because debt is so high and college is so expensive that the textbook cost matters so much to my students. When we started using the new free anthology, students were so grateful to save that money. When we started using the open anthology, I started becoming more knowledgeable about open education in general. 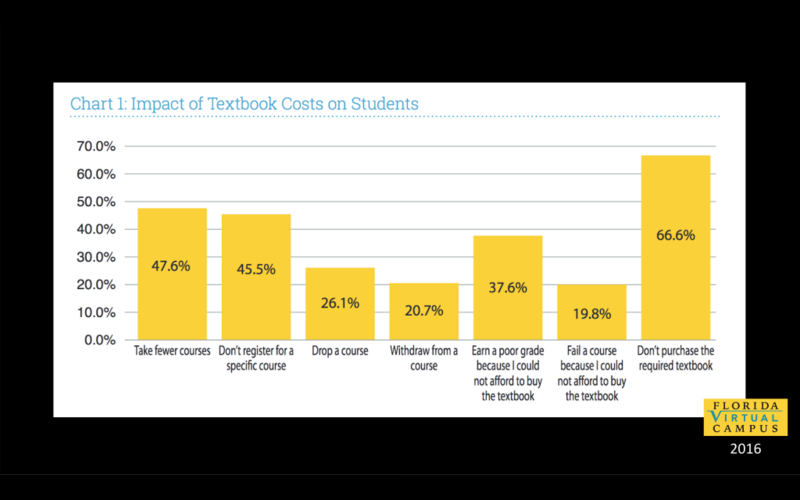 I learned about how many students withdraw from or drop out of courses because they can’t afford textbooks. It stunned me, even though I always have students in my classes who can’t afford the book, and I always notice that not having the book makes it harder for them to do well. Confronting the statistics was a bit of a shocker for me. It wasn’t so much that I got more concerned about textbook costs. It was that I started wondering, what other access issues are preventing my students from coming to the table to learn? I started a food pantry in my academic department the semester after I started using OER. These were part of the same gesture: to reach back into students’ lives to find the barriers that were preventing them from learning and offer a small bridge across. 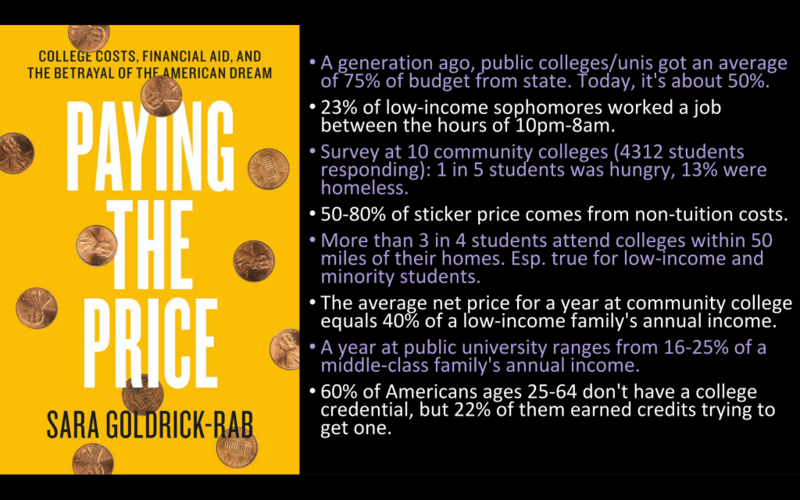 The biggest issues in the US right now beyond tuition costs are: the costs of learning materials, food insecurity, transportation costs, child care costs, and lost opportunity costs. What would happen if I started seeing these not as issues for student life offices to address, but academic issues that I as a faculty member should address as I design curriculum, order supplies, and create program and course policies? As I expanded my understanding of what constitutes an academic issue and learned more about the challenges my students were facing in enrolling in and completing college, I began to understand that “open” was less about “low cost” and more about “accessible.” We could reduce costs at my own tuition-driven university by curtailing library hours or increasing class sizes (and, at various times, we have! ), but that does not increase student access to learning; cost-savings alone don’t guarantee increased access. Even making college free wouldn’t mean that single parents or those in remote areas without access to a car would be able to come. What I really cared about was access, not cost. what is preventing this student from learning? what could I do to remove or reduce that barrier? And this provoked me to ask another question. Why is access to knowledge important? It’s probably a question we don’t ask a lot because it seems patently self-evident. But if you press just a bit, the other part of open opens up. The reason I want my students to be able to learn is that I believe they should all have a part to play in shaping our future world. I think less about training students than I do about empowering them to transform; this goes for labor markets and for culture. I think most of us hope both that our students will be successful, but also that they will have some say in what constitutes success, that they will imagine and enact a world that is an improvement over the one that we currently teach them about. The question of accessibility led me to the issue of empowerment, since access to knowledge seems important only if you pair it with access to knowledge creation. It wasn’t the power of the 5 R’s that made me excited to use OER. It wasn’t the fact OERs cost nothing, or the fact that they carried an open license. It was that suddenly I had a framework for understanding teaching that seemed broad and brilliant enough to keep up with the actual work. I knew that every day my students were struggling with life or death issues that were wrapped up tightly in how they came to– or were prevented from coming to– the material in my classes. And I knew that every day their paradigms were shifting as they learned. And I knew that every day those paradigm shifts and life or death challenges were coalescing into something that my students understood about the world– something that was new, important, and worthy of being heard. When my students gain access to knowledge, I want it to be part of a larger invitation: we trust that you have important lessons to teach the world, and we trust that the knowledge you access today will be changed by your perspective, that you will open doors to new ideas that we, your current teachers, never could have taught you. The next world will be built by the ideas we haven’t yet heard, and the university of the margins is where we will nourish its architects. 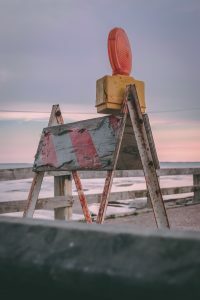 What is a barrier that students face in entering or completing your course or program that your course or program is currently not explicitly addressing? How could your course or program (not some other office) explicitly reduce that barrier for students? Why does this matter not only for students, but for your field?